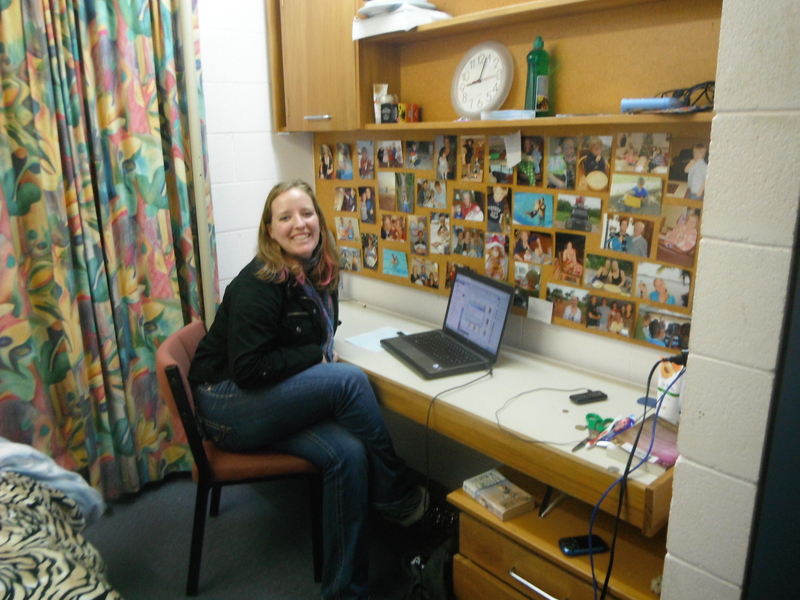 At my desk inside my dorm at city. Notice not vomit stains, broken doors, or damaged windows… in my room at least. About to go jump off bridge! This trip went by a lot faster than Ghana did. I can’t decide if it is because the second half of a trip always feels faster than the first, or if New Zealand was so much less challenging than Ghana was so time just flew right by…there was no 11th minute to remind me that sometimes time can stop and frustrate me for a bit. Maybe it’s a mixture of both. 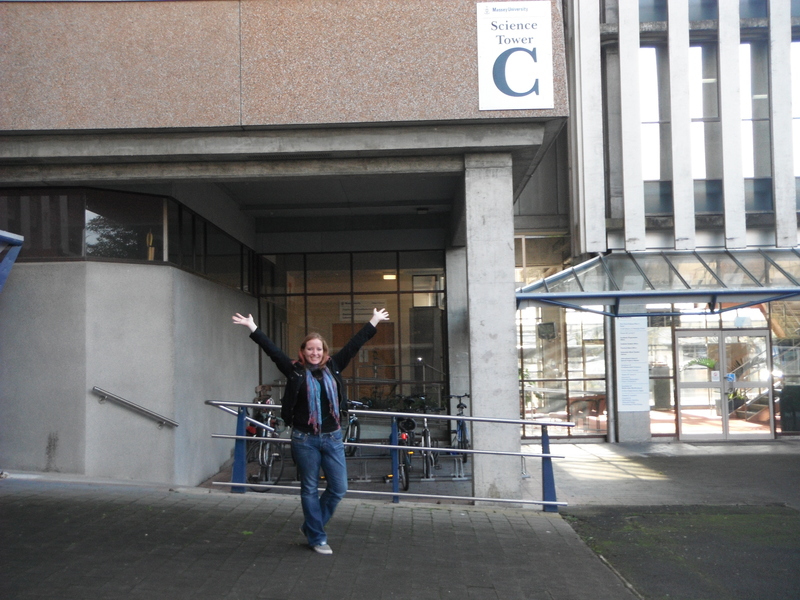 Regardless, as it turns out, my year of study abroad is coming to an end- I have 2 full days left in good old Palmy. So, I think now would be the best time to share the most memorable moments that I have had here. 1. Traveling was not always smooth sailing. 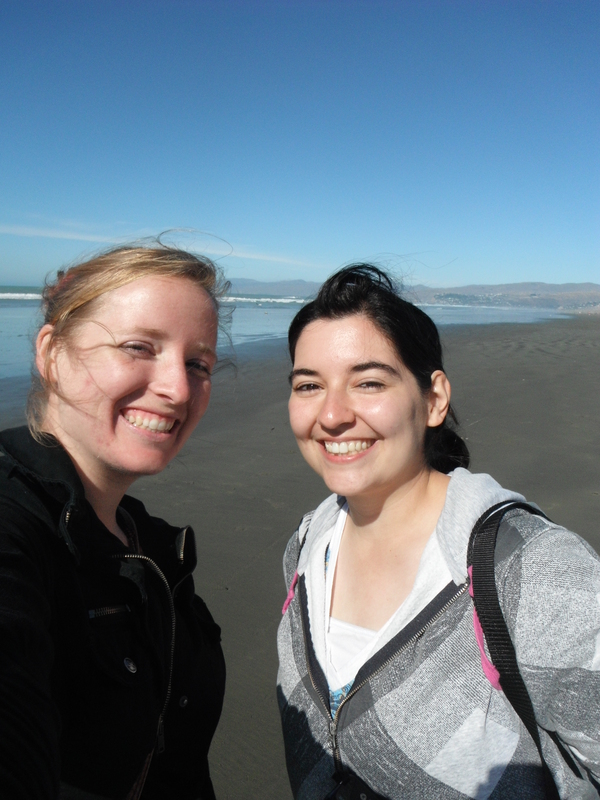 When we got to Christchurch, there were so many detours that we had to take, and closed roads that we had to avoid (because of the tragic earthquake) that we ended up walking a lot. A LOT. I am talking 8 hours of just walking, seeing the tragic sites of the city because we could not figure out the local buses. It was miserable. Our feet were covered in blisters, our legs were sore, we were hot, we were hungry (virtually all the restaurants were closed due to the quake), and we were lost, only to be surrounded with hopelessness and despair. At this point, I looked at Liz and said “Gosh, If I knew that this is what the day was going to be…..imagine if we were traveling with some real complainers.” Liz looked at me with pure frustration in her eyes, then shouted- with a voice like gravel “THIS IS FUN!” without a trace of a smile on her face, and quickly looked away like she was trying really hard to believe it. After that- the day really did seem fun. True story! I was sitting in my microbiology lab, talking to a cute lab assistant who happened to also be doing the lab for me. I really am a good student, I really do work hard, but when it comes to math…and there’s a cute lab assistant, who is really smart and is going to study at Oxford next semester, and who remembers my name, and who is asking questions about myself….yeah, he can do the lab for me while I sit and talk to him. Well, as it turns out, he is an RA for one of the other halls, and had seen me around. He asked if I lived on campus, and I promptly replied “Uh, yeah, I live in City.” He looked up from my nearly completed–but still unfinished–lab and said “OH GOD.” And then handed the lab back to me. I tried to promise him that I was one of the good ones, but…no luck. I was back to doing my own work again. All alone. 4. Public transportation can be a great thing. Most of the time. However, it seems like most days, Liz and I are always late trying to catch a bus, and running to the stop last minute. One particular day, we were exiting the mall- running a bit late because I decided I absolutely needed some chocolate before we left. Low and behold, when we left the mall, our bus was already at the light at the intersection, the light after the stop that we normally get on the bus. So, we ran to the next stop as fast as we could, in hopes of making it there before the light turned green. Bags were flying everywhere, people were looking at us funny, and our hearts were beating fast. We made it. In fact we made it with time to spare. For someone who can’t run (probably be cause I am so obese) it was impressive, I must say. The light turned green and the bus came our way, we stepped forward bags all ready, bus card in our hand. The bus pulled over. And then the bus left. It left us standing with our arms out at the stop like the driver had not just seen us run to make the bus. That bus driver must have thought I was that obese girl who lives in City and breaks down doors for fun or else vomits all over the floor because I am having too much fun, and then asks other people to pay to clean it up. Why else would he have left? We laugh about it now…a little bit. 5. 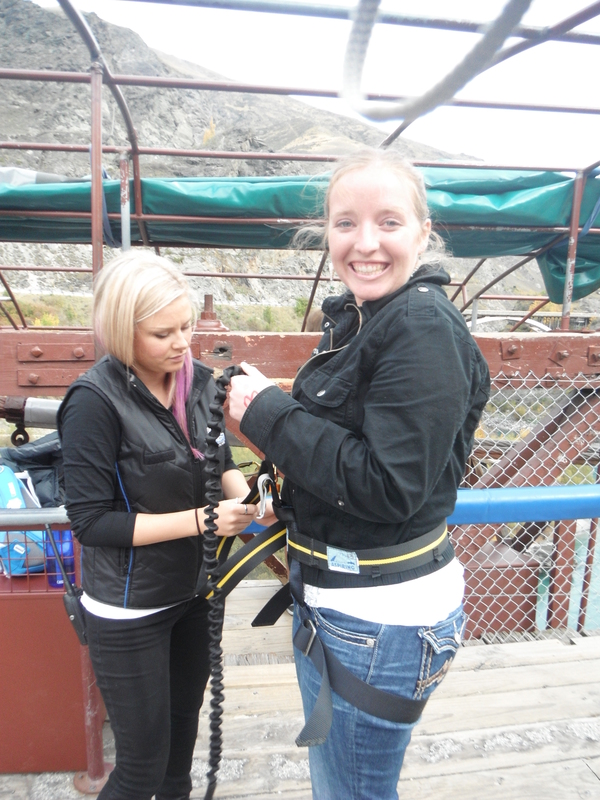 When we were in Queenstown, I finally got to try bungee jumping. I have been wanting to try bungee jumping ever since my 18th birthday when I went sky diving, and I have not had the chance until this trip. I was so pumped. I wasn’t the least bit nervous. I was smiling cracking jokes, laughing at the guide’s silly remarks that involved putting our harnesses on after they claimed they had never done a tandem jump before, and that if it worked out it would be really cool. Liz kept asking me how I could not be nervous. All I could say was- Liz this is going to be great. Then I stepped up to the edge…and then I looked down. All of a sudden, all I could think was, “wait….you want me to do what?…you want me to jump…down there…?” It was so high. I don’t know if I will ever think of the phrase “Go jump off a bridge” the same again. I have a bad habit of not thinking these things all the way through- first, only imagining the plane before I went to West Africa, now jumping of a perfectly good bridge. Needless to say, I loved it. Overall, New Zealand has been full of some pretty good laughs…and ok, maybe a few 11th minutes. But, I’m almost home now! Two more days!! Then I get to go back to reality. It really is kind of a bummer that it has to end so soon. If only I could work my way to getting a plane ticket for China. Humph. One day.